- No need to come to Miami to shop for furniture,let us do the shopping for you. - Our dedicated international sales staff will guide you through the entire process. - Choose your preferred shipper or we can recommend a few for you. - We offer the widest selection of fine quality furniture. - Discounted pricing available for multi-room purchases. - Buy Online and save! 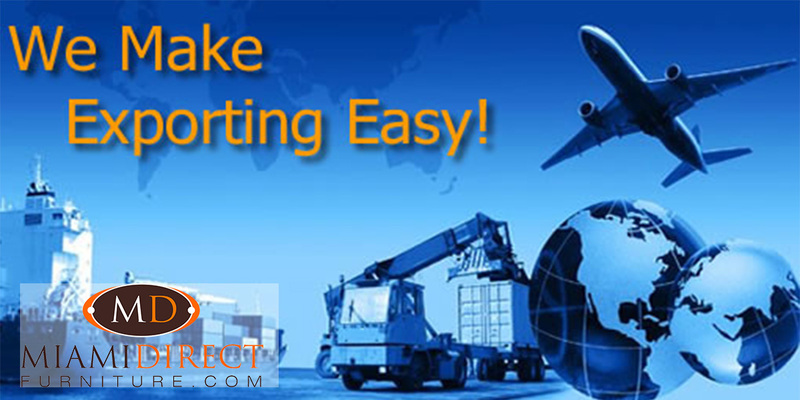 We provide export to several destinations within the Caribbean, South America,and Central America. These countries include and are not limited to: Anguilla, Antigua and Barbuda, Argentina, Aruba, The Bahamas, Barbados, Belize, Bermuda, Bolivia, Brazil,British Virgin Islands, Cayman Islands, Chile, Colombia, Costa Rica, Cuba, Dominica, Dominican Republic, Ecuador, El Salvador, Grenada, Guatemala, Guyana, Haiti, Honduras, Jamaica, Mexico, Montserrat, Netherlands Antilles, Nicaragua, Panama, Paraguay, Peru, Saint Kitts and Nevis, Saint Lucia, Saint Vincent and the Grenadines, Suriname, Trinidad and Tobago, Turks and Caicos Islands, Uruguay, and Venezuela. When you place an order, we will estimate shipping and delivery dates for you based on the availability of your items and the shipping options you choose. Depending on the shipping provider you choose, shipping date estimates may appear on the shipping quotes page. Please also note that the delivery rates are one flat flee and are scheduled to change without prior notice. All international orders must be prepaid via credit card ( Copy of Id and Credit card may be required) , wire transfer or bank check. Any other export/ import fees, applicable taxes, custom duties and freight will be the responsibilities of the purchaser. No warranty will be valid for merchandise that is being shipped overseas. Customers must file a damage claim with the carrier before any replacement is considered. In order to ensure that your delivery is processed as quickly as possible; please contact us by calling 954-432-6826. Please indicate to the customer service representative that your order will be delivered to a freight forwarder. Additional delivery information maybe required to ensure accurate processing of your order. Additional delivery charges may apply to these order types based time frame and location for delivery. This agreement is with you and Miami Direct Furniture. Neither Miami Direct Furniture nor the 3rd party Delivery Company that has been contracted by Miami Direct Furniture to perform the delivery will be held responsible if you decide to hire a 3rd party contractor or freight forwarder to accept, receive and sign for the receiving of items without the notations of visible defects of packaging, damaged items, or missing merchandise. There is no Warranty Coverage on items being exported outside of the United States. Any claims for damages are on a case by case basis and a repair or placement option will be at the manufacturer's discretion only. 1. All merchandises are packed carefully and correctly utilizing a double check method before it leaves our facility. 2. Damaged shipments should be checked in the presence of the carrier. Please keep all shipping cartons and packing material for carrier inspection. 3. Miami Direct Furniture will not initiate any claims with the carrier. Claims for shortage of items must be made within 48 hours after receipt of merchandise. 4. Claims of damaged shipments must be made by the customer with the carrier. 5. Items that are reported Short Shipped will be reordered and delivered to your freight forwarder free of charge after an investigation of original delivery has been completed. 6. Miami Direct Furniture will not be responsible for any additional fees that may apply.